Generously spray 12-­inch nonstick skillet with cooking spray; heat over medium-high heat. Cook pork chops in skillet about 6 minutes, turning once, until brown on both sides. Remove pork from skillet; cover to keep warm. Reduce heat to medium. Add onions to skillet; cook 3 minutes. Stir in broth and pepper. Return pork to skillet; spoon onion mixture over pork. Cover tightly and simmer 12 minutes or until pork is no longer pink and meat thermometer inserted in center reads 160°. Mix milk and flour in small bowl. Add to skillet; cook 2 to 3 minutes, stirring constantly, until thickened. “Pork is one of my favorites, but I’ve never thought of it as a ‘healthy’ option. 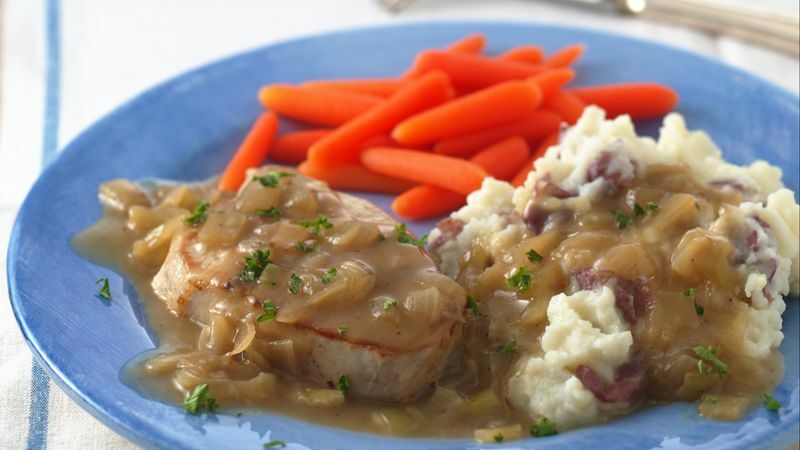 This tasty recipe changed my mind.” Marilyn B. Lean meat is not the fat culprit it’s been thought to be. When trimmed of excess fat and moderate portions are eaten in the context of an overall low-fat diet, meat is a great choice because it contains many nutrients, especially iron, which is so good for your heart.